Hi everyone! 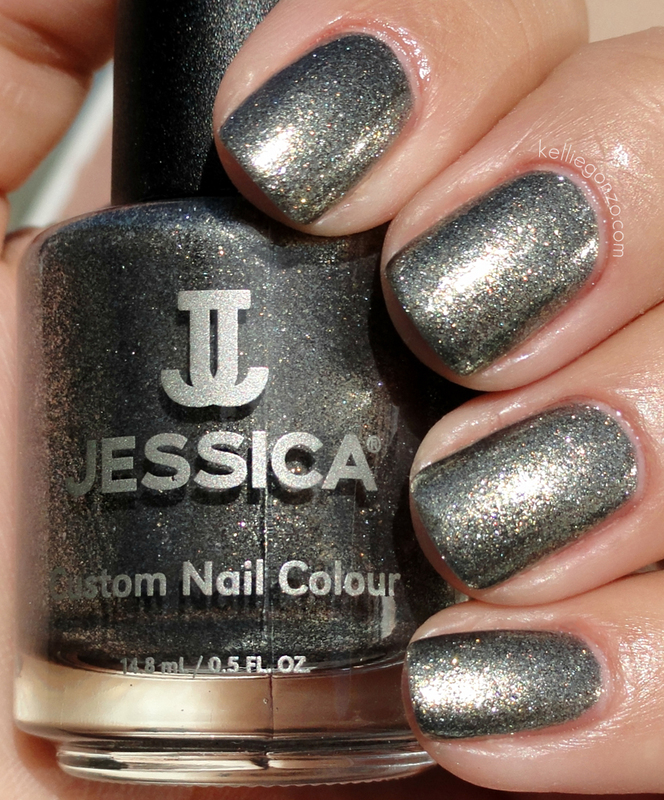 Today I want to show you one of my favorite new polishes, Smoky Feather by Jessica Cosmetics. It is my first Jessica polish ever, crazy huh! I really like their bottle design, the handle is nice and grip-y and the logo is sleek. I got this polish mainly because it is a dupe for Chanel's Graphite, which I passed on when it came out but have been regretting ever since. In fact, this collection trio, Peacock Queen, are all dupes for Chanel's Fall 2011 polishes that caused such a big splash. The polish is an olive green tinged pewter metallic shimmer with tons of microglitter that just glows! This swatch is two coats. It's really super beautiful in person. I bought this on NinjaPolish.com for $6, which is a $20 price difference from the Chanel polishes. I've heard that it's slightly less sparkly than Graphite, but honestly at that price, it's hard to discriminate.